what is the browser with use ? Bought a new to me laptop this week. Fresh install on a M4 using syslinux and systemd now. Just now figured out bumblebee and systemd. Runs much, much cooler with bumblebee. @doug piston: looks awesome, so to speak. Sure. It was taken from a PS1 thread on this forum. I haven't looked at it since. It is xxxterm I love it. Oh and you won't be disappointed with FreeBSD . After more than a year away from fluxbox I came back. Here is my first shot at it again. The developer of xxxterm/xombrero and scrotwm/spectrwm and adsuck and a bunch of other things, Marco Peereboom, is a OpenBSD developer, not FreeBSD. He Never said it was made for FreeBSD but It's still a good alternative to popular web browsers. That's great. Would you have a few more details? Exactly! I know it was developed by Peereboom on OpenBSD - I had used the browser in its earlier stages and channeled lotsa traffic to his personal website, the default on xxxterm, as I introduced many a friend to it-, I just said it was a great alternative choice and that the screenie made me want to try FreeBSD out. BTW, other than an old FreeNAS it's the first of the BSDs installation. Running pretty well on Virtualbox and I may try it on my iMac G3, if I can get it to boot out of the CD drive. 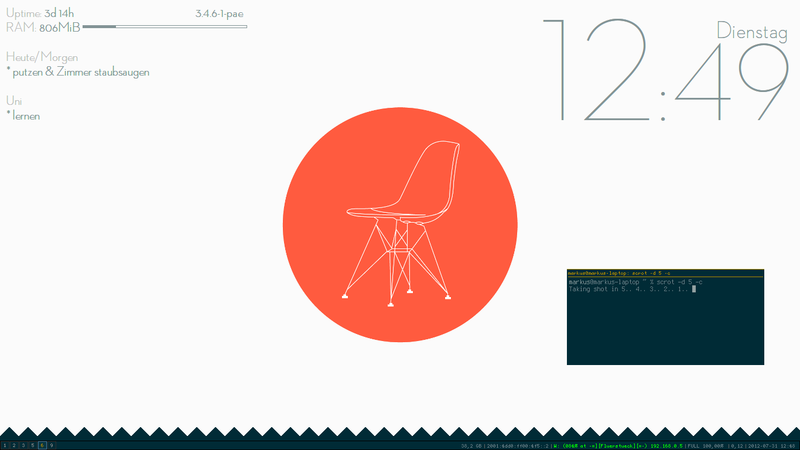 Using tint2-svn for the bottom bar and conky for the top bar. posted in August to a July screenshot thread?